HE HAD NO MASTER PLAN. The book of Hebrews tells us that "by faith Abraham obeyed and went, even though he did not know where he was going". He had no map, no AAA brochure, no lineup of motel reservations along the way. His caravan simply headed west toward the Mediterranean, and that was that. God had said he would show him where to stop sometime in the future when he got to wherever he was going. We would struggle with this, wouldn’t we? Not only in our vacation travel, but in guiding our careers and our churches, we simply have to have a comprehensive plan. I hear preachers say all the time, "Let’s see, regarding this or that work, will it pay? Is it going to be cost-effective? Will everyone be pleased?" We do very few things by faith. Abram didn’t have a clue. If you had met up with his caravan at some oasis, the conversation might have gone like this: "Mr. Abram, where are you going?" "I don’t know." "Well, how will you know when you get there?" "I don’t know that, either. God only said he would show me." "You have quite an entourage here. When you do arrive, who will supply all the food you’ll need? After all, if you’re going to survive in a new place, how are you going to eat"? "I don’t know. He just said he would take care of me." "You don’t seem to have a security force. Who is going to protect you from the Jebusites, the Hittites, the Amorites, and all the rest of the warring tribes? "Abram would just shake his head and wander away. Faith is happy to step out not knowing where it’s going so long as it knows Who is going along. As long as God’s strong hand was holding Abram’s, everything was going to work out just fine. The caravan moved ahead in faith. We like to control the map of our life and know everything well in advance. But faith is content just knowing that God’s promise cannot fail. This is the excitement of walking with God. When we read the book of Acts, we never quite know what’s going to happen with the next turn of the page. The Spirit is in control, and that is enough. Paul had no formula as to how he would evangelize; he was simply going by faith. God unveiled the route as he went along. The promise at the beginning of the book of Acts is "You will receive power when the Holy Spirit comes upon you”. No wonder Jesus told the disciples to "wait for the gift my Father promised" Just as Abram and his wife Sarai had to wait with expectation for what God had promised them. Having faith in the promise is the key and the only hope for anybody’s church. The great search in too many church circles is not for leaders with the faith of Abram who are willing to trust God wherever he leads, but rather for leaders who are sharp and clever at organizing. We forget that the Church was founded in a prayer meeting. Simple men full of faith and the Holy Spirit led it in its earliest and most successful years. They concentrated not on "the secret of church growth”, but on the secret of receiving the power God has promised. Because of their faith, the Lord gave them both power and growth. 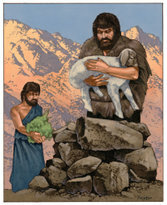 Paul was humble enough to admit to the church at Corinth, "When I came to you, brothers, I did not come with eloquence or superior wisdom as I proclaimed to you the testimony about God. . . . My message and my preaching were not with wise and persuasive words, but with a demonstration of the Spirit’s power, so that your faith might not rest on men’s wisdom, but on God’s power" (1 Corinthians 2:1, 4-5). This approach to ministry and igniting faith in God’s people is rare today. In fact, God has a wonderful plan for all his people. But He doesn’t have to tell us much about it if he chooses not to. All He asks is that we take his hand and walk along in faith. He will show us soon enough what should be done. HE FAILED DRAMATICALLY, BUT REBOUNDED. stakes and moved. Whenever we stop living by faith, we start doing what we think is smart or what circumstances dictate. We soon find ourselves in a weakened position. We get into trouble quickly. As they neared the Egyptian border, Abram took one look at his beautiful wife and said, "Sarai, I see some problems down the road. Pharaoh and his men will desire you, and they’re going to kill me in order to have you. So we’d better lie and say you’re my sister instead of my wife." The little scheme only half-worked. Abram avoided losing his life, but poor Sarai was led away to join the royal harem. What an outrageous and low-life thing to do to your own wife! You can be sure the women in the harem didn’t get to just sit around there in the palace having Bible studies. Abram saved his own neck, but risked Sarai’s virtue and future. God was watching this whole mess develop and decided to intervene with judgment. Now, if anyone deserved punishment, it seems it would have been Abram! He was the rascal here. But instead, "the Lord inflicted serious diseases on Pharaoh and his household", which quickly led Pharaoh to summon Abram. Pharaoh’s wrath exploded in Abram’s face: "What is your problem? Why didn’t you tell me this was your wife? Take her and get out of my country, now!" Imagine this great man of faith getting rebuked by a pagan king! What a remarkable lesson, that in the life of faith, we can wander from the promises and fail so miserably. Nobody yet has walked the perfect faith life. But the important thing is to get back up and back on track. Abram "the father of all who believe" was not quite down for the count. He and Sarai scurried back again to the land where they belonged, "to the place between Bethel and Ai where his tent had been earlier and where he had first built an altar. There Abram called on the name of the Lord". It seems he could not rest until he got back to the altar where he had once worshiped God. Back to the place where he had stood so faithfully on the promises made to him. Whenever we fail God, it is vital to return quickly to that altar of consecration and faith. God is waiting for us there, like the prodigal’s father waiting for his son to return. He looks forward to getting us back on track. The greatness of Abram was not in his moral perfection, but in his getting back to God and believing again. Too many times we worry about who is forgetting us, who is not giving us credit, who is reaping benefits at our expense. We lose touch with the fact that when God "brings one down, he exalts another". Both in the worldly environment and in church work, we are anxious about things that are better left in God’s hands. Worry always nips at the heels of faith and tries to drag it down. Faith deals with the invisible things of God. It refuses to be ruled by the physical senses. Faith is able to say, "You can do what you like, because I know God is going to take care of me. He has promised to bless me wherever he leads me." Remember that even when every demon in hell stands against us, the God of Abraham remains faithful to all his promises. Jesus Christ can do anything but fail his own people who trust in him. Why not start afresh today to follow in the footsteps of "Father Abraham"? Begin carefully and prayerfully to search the Scriptures, asking the Holy Spirit to make God’s promises come alive to the point where you can live off them, even as Abraham did. Don’t be afraid when you don’t know exactly how God will lead and supply for you. Rather, just hold firmly to his hand and walk in faith. There is no need to worry about what the other person might be doing. It really doesn’t matter, because God has promised to uphold and defend you. Finally, if you are someone who has "gone down to Egypt", walked away from your initial trust and consecration to God then return right now with all your heart to the Lord. Go back to that altar you once made as a place of worship and surrender to God. He has promised to receive everyone who comes to him through Jesus Christ our Lord. Don’t hesitate because of how far away you have strayed or what you did while you were there. Although you cannot see him, the Father watches for you even now, waiting with compassion and love for your return home to him.